Loomstate !Act Natural! Blog: Oil Update + Surfrider Foundation Speaks Out! Oil Update + Surfrider Foundation Speaks Out! 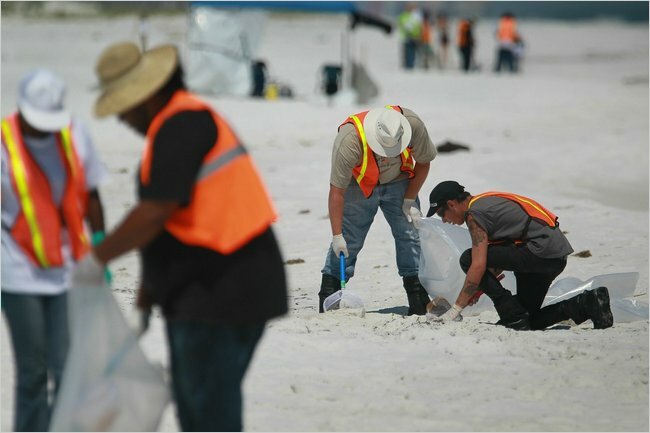 Workers cleaning oil residue that washed up on Pensacola Beach in Florida on Monday. One look at the NYT's U.S. front page makes our stomach turn. Continue to voice your opinion against offshore drilling through the Surfrider Foundation here. Also, see other ways to help in our roundup.